Quite a few of these first shot torso/head combinations have come into the market as a result of a find of them in 2001. These, unlike most common first shots, had a very specific purpose however. Originally, all SW figures had the neck pin as part of the head and would fit into the torso just like the limbs did. Therefore, since the plastic used for limbs and head was softer than that used for the torso, the head was more susceptible to snapping off. As a solution to this, starting with ESB, the figures' design incorporated the neck pin into the front torso half. Since the torso was made of a harder plastic than the limbs were, the peg became more rigid and reduced the risk of the head snapping off. The first shot torsos with heads, like the ones seen above, were used for pull-tests to make sure this strategy worked. These first shot torso/head combination can be found in many variations-- painted, unpainted, sonic-welded, non-sonic-welded, etc. 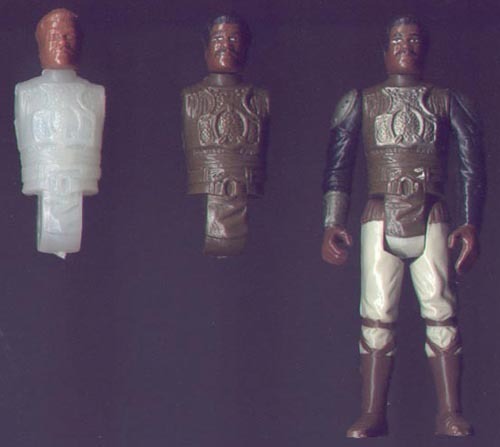 The torso on the left is a front torso half in non-production colors with an unpainted head. The torso on the right is an unpainted sonic welded torso with a painted head. The rightmost figure is a standard production figure for comparison.